What is the Fascia and Soffit on the Exterior of My House? The “fascia” of your home is the front edge of the roof line. It is right underneath the edge of the shingles. The fascia can be made out of aluminum or it can be cedar or fiber-cement board like your siding (James Hardi Siding is an example of this). The “soffit,” on the other hand, is the part underneath the overhangs of your roof. (Not to be confused with an interior soffit, explained here). This can also be made of sheet metal, wood or fiber-cement board. 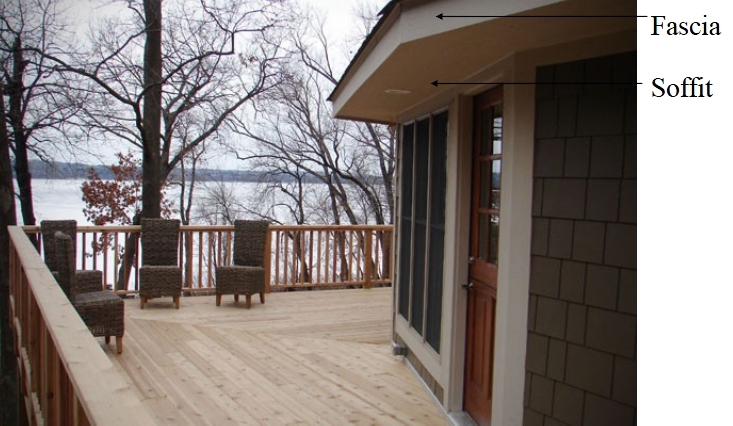 Both the fascia and soffit are available prefinished in a variety of colors, or they can be stained or painted on site. The fascia is more visible, often, than the soffit – at least from the front of your home. Typically, the fascia and soffit are both the same color, and they become the trim color of your home’s exterior. The gutters also usually match these two elements, creating a seamless transition from the siding and roof colors to the trim of the home. The photo above is a great example of this. The fascia and soffit are the same color as the trim around the doors and windows.